In the last two decades, the small/medium sized farms that raised animals in a humane fashion have been replaced with factory farms that confine thousands of cows, hogs and chickens in tightly packed facilities. These large scale operations produce millions of gallons of manure that inevitably spills into waterways from leaking storage lagoons or fields where manure is over-applied to soil. (You can see an example of a storage lagoon in the Spy Drones Expose Smithfield Foods Factory Farms video.) Manure, especially in large quantities, creates an environment that is harmful to humans. It is the hazardous air pollutants filled with contaminants that endanger us. Neighbors of factory farms, as well as the workers in them, commonly suffer intensely from headaches, nausea and other long-term health effects. Mark Devries will continue investigating factory farms with the use of drones, and will continue releasing videos with the findings of his investigations. 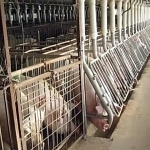 We’ve known the horrific conditions animals endure when raised in factory farms. 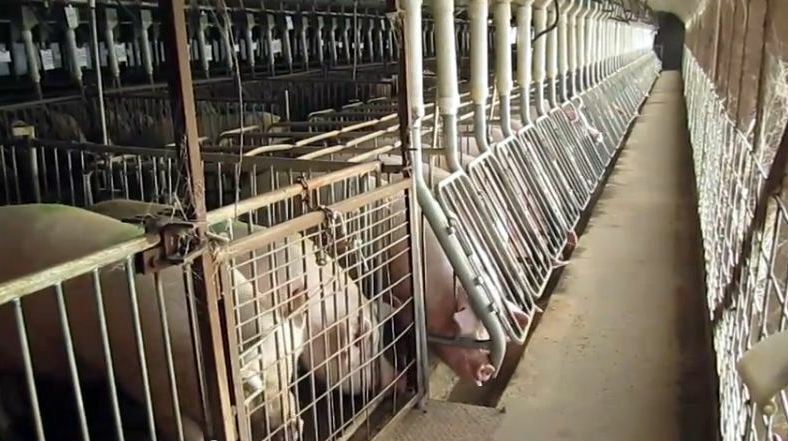 One could only hope we have all seen some footage that shows chickens, cows, or pigs crammed into tiny spaces so filled that the animals cannot turn around or lay down. One thing we haven’t seen until now are the cesspools created by factory farming. Bacon’s a thing these days. Yummy and bad for you — mmmm. But here’s what a drone saw when it payed a visit to some pig “farms” run by the world’s biggest pork producer. 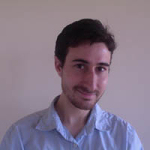 Mark Devries produced and directed the award-winning 2013 documentary Speciesism: The Movie, which screened at theaters worldwide and has been featured in Scientific American (“brilliant and compelling”), The Huffington Post (“tremendously entertaining”), CNN Headline News, Psychology Today, and most popularly The Sydney Morning Herald, among many others. Devries filmed the world’s first aerial drone footage of factory farms, released as part of his 2014 Factory Farm Drone Project, which has been viewed by millions worldwide. Devries continues to appear and speak at special screenings of Speciesism, while working on several new projects. Devries currently lives in New York City. Smithfield Foods, Inc. is an American company and the world’s largest pork producer and processor. Headquartered in Smithfield, Virginia, it runs facilities in 26 U.S. states, including the largest slaughterhouse and meat-processing plant in the world, located in Tar Heel, North Carolina. It also has operations in Mexico and in 10 European countries, with a global total of over 46,000 employees and an annual revenue of $13 billion. Smithfield was founded in 1936 by Joseph W. Luter and his son as the Smithfield Packing Company, now its largest subsidiary. From 1981, it began to purchase companies such as Eckrich, Farmland Foods of Kansas, Gwaltney of Smithfield, John Morrell, Murphy Family Farms of North Carolina, and Premium Standard Farms. It was able to grow as a result of its highly industrialized pig production, raising the animals using a vertical integration system of production that enables the company to control their development from conception to packing. Thousands of livestock are housed together in barns with metal roofs, known as concentrated animal feeding operations, where they are permanently confined. The company raises around 15 million pigs a year and processes 27 million, producing over six billion pounds of pork. It was the top pig slaughter operation in the United States in 2007, at 114,300 pigs a day, and along with three other companies slaughtered 56% of the cattle processed there until it sold its beef group in 2008. Smithfield sells its products under a variety of brand names, including Cook’s Ham, Gwaltney, John Morrell, Krakus Ham, Patrick Cudahy, Smithfield, and Stefano’s. C. Larry Pope is the president and chief executive officer.